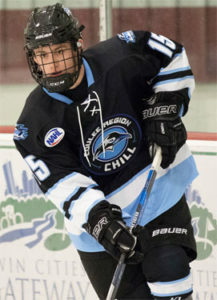 Coulee Region Chill of the North American 3 Hockey League is not only off to a solid start to the 2018-2019 season but its top two scorers have future Division 3, National Collegiate Athletic Association commitments. High scoring forwards Brady Lindauer and Thomas Magnavite have both secured commitments to play at Minnesota-based St. Mary’s University next season. Lindauer (in photo) currently tops the Coulee Region scoring chart with 11 goals, 18 assists, 29 points in 14 games. Magnavite has played in only 11 games thus far this NA3HL season but has 14 goals, 7 assists, 21 points in a Chill uniform. As part of the Central Division of the NA3HL, the Wisconsin-based Chill has a record of 8-5-1 through 14 outings. Coulee Region is part of a 36-team, 6-division NA3HL. The Chill is owned by the first lady of junior hockey, Michelle Bryant, and is coached by Jon Vaillancourt.